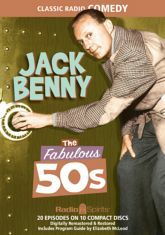 It's mid-century madness as Jack Benny slides smoothly into the 1950s with great guests, hilarious running gags, and even a song or two! This classic collection features episodes from Jack's final years on radio, accompanied by his constant cohorts Mary Livingstone, Phil Harris, Bob Crosby, Eddie "Rochester" Anderson, Dennis Day, the Sportsmen Quartet, and Don Wilson. Includes twenty digitally restored and remastered episodes, and a Program Guide by radio historian Elizabeth McLeod.